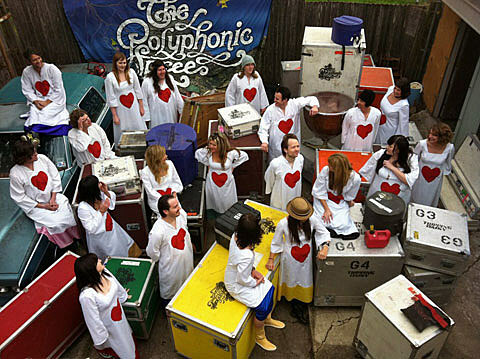 THE POLYPHONIC SPREE “YOU + ME” PHASE ONE from Good Records Recordings on Vimeo. 3/29/12	The Crescent Ballroom	Phoenix, AZ	Coming Soon! 3/30/12	Rialto Theatre	Tucson, AZ	Coming Soon! 4/01/12	House of Blues	San Diego, CA	Coming Soon! 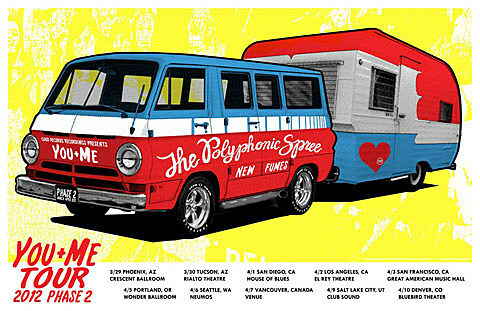 4/02/12	El Rey Theatre	Los Angeles, CA	Coming Soon! 4/03/12	Great American Music Hall	San Francisco, CA	Coming Soon! 4/05/12	Wonder Ballroom	Portland, OR	Coming Soon! 4/06/12	Neumos	Seattle, WA	Coming Soon! 4/07/12	Venue	Vancouver, BC	Coming Soon! 4/09/12	Club Sound	Salt Lake City, UT	Coming Soon! 4/10/12	Bluebird Theater	Denver, CO	Coming Soon!